Fresh vs. Canned Pumpkin, which is best? 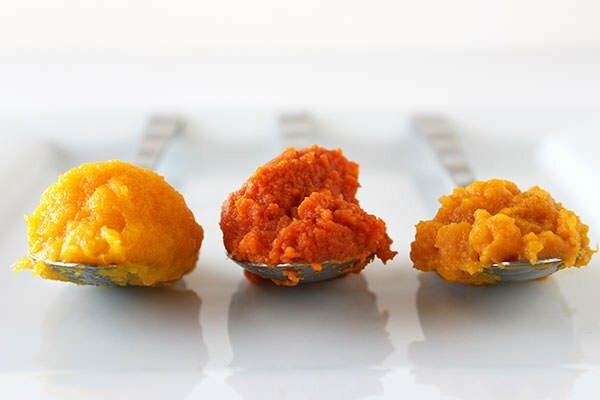 Testing fresh pumpkin puree, regular canned pumpkin, and organic canned pumpkin to find out! Plus a how-to video. 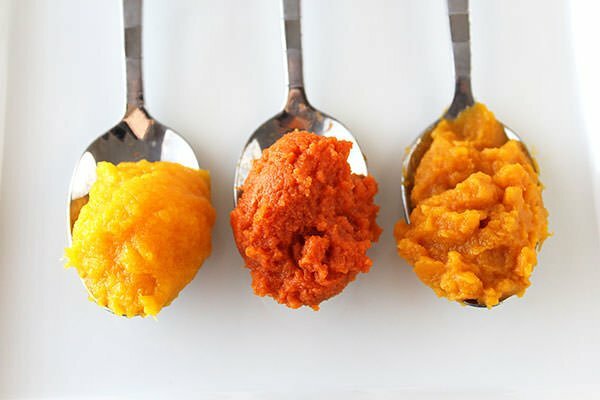 Recently on my Facebook page I linked to a post from one of my favorite food blogs, Fifteen Spatulas, comparing fresh vs. canned pumpkin purees. I thought it was genius and you guys seemed to love it too, so I figured I ought to do my own test! You guys know how I love my kitchen experiments. Reader Tracey commented that she likes to use organic canned pumpkin puree which intrigued me because I’ve never used that, so I wanted to add it to my comparison experiment as well. I hope you find this experiment interesting, I certainly did. I always have so much fun figuring out what ingredients and techniques make for the absolute best recipes. Be sure to let me know which is your favorite in the comments below. Before we get into the fresh vs. canned pumpkin nitty gritty, I wanted to quickly share a how-to video and easy recipe for making your own homemade fresh pumpkin puree. It’s surprisingly simple! Alright, so now that we now how to make fresh pumpkin puree and what it looks like, let’s see how fresh compares to the canned stuff. Which do you think will be the best? From left to right: Fresh, regular canned (Libby’s), organic canned (Farmer’s Market brand). As you can see from just a quick visual assessment, there is a big difference in color and even in texture between these three purees. The fresh is notably the lightest in color, it almost just looks like any ol’ pureed squash. The organic is the second darkest while the regular canned stuff is practically a completely different color. A quick Google search revealed that Libby’s uses a proprietary variant of the Dickinson pumpkin, which actually looks more like a butternut squash than pumpkin. 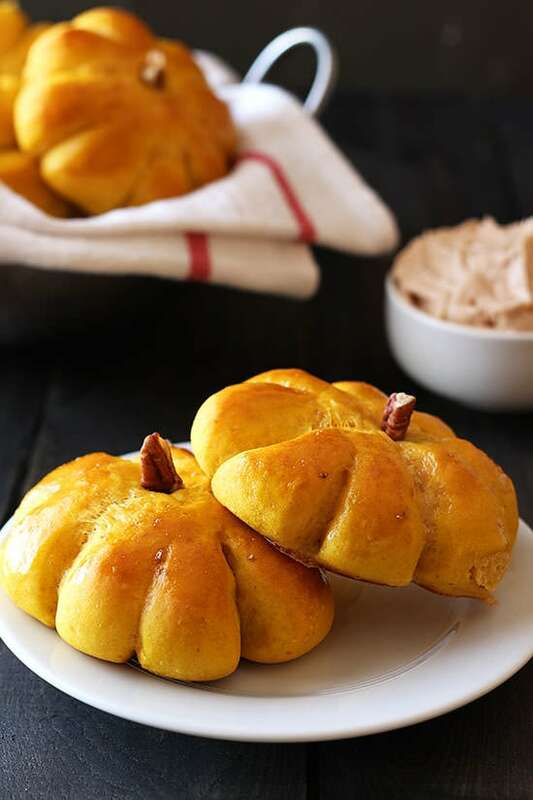 The claim is that these pumpkins have been grown specifically for pumpkin puree in cooking and baking, so the result is a sweeter and creamier product. Interesting. As I mentioned in the video, if you attempted to make pumpkin puree from a regular field pumpkin that you would use to carve for Halloween, the result would be stringy, watery, and bland. That’s why we use pie or sugar pumpkins, though they are certainly no Dickinson pumpkin. While Libby’s canned pumpkin puree contains no preservatives, the actual act of canning and sitting in a metal can for who knows how long has to affect the taste. I’d be curious to taste test fresh Dickinson puree vs. pie/sugar pumpkin puree. Fresh: Squashy/pumpkiny, raw and unprocessed, almost herbaceous flavor. Regular Canned: Deep, slightly intense flavor but just different, maybe even “off” from the fresh. Organic Canned: More similar to the fresh stuff than the canned, but not quite as bright. Since in most pumpkin baking we add tons of sugar and spices, I realized the texture was as important as the taste. In fact, pure pumpkin puree kind of just tastes like straight up baby food. I hadn’t thought much about that beforehand. Let’s just say this taste testing wasn’t nearly as scrumptious as some of my other kitchen experiments! Fresh: Velvety, creamy, and slightly loose and fluffy. Regular canned: Loose, smooth, very thick, reminiscent of ricotta cheese. Organic canned: Strange almost gelatinous texture (it took the shape of the can), watery. As you can see it’s unable to stand tall on its own like the other two in the above photo. 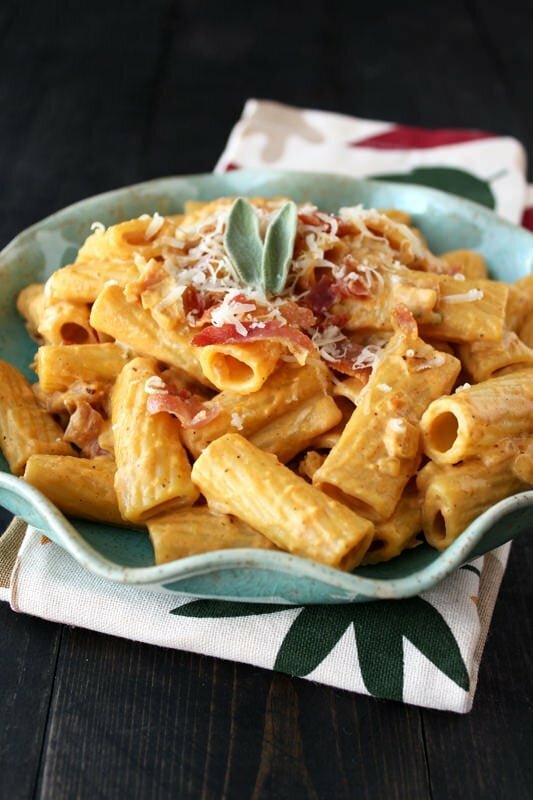 The texture of the organic canned pumpkin surprised me the most. It was just weird. It totally turned me off and I don’t think I’d use it again, not just because of the weird factor but because of the watery factor which became even more apparent after I used it to bake mini pumpkin pies and when I froze the leftover (it froze hardest fastest and iciest). 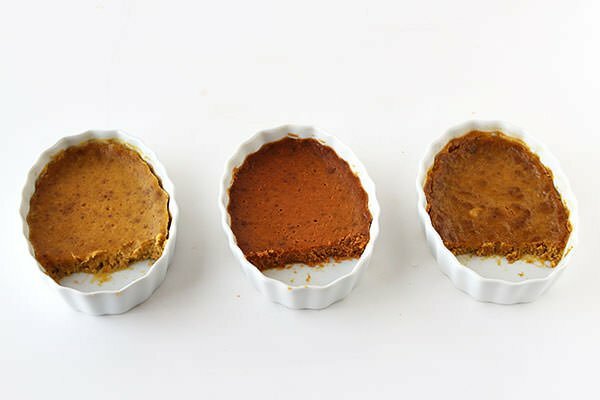 Once baked into mini pumpkin pies (following the standard recipe from Libby’s), the color differences among the purees became less obvious. At this point, after adding enough sugar and spices to disguise the original pumpkin flavor, it was all about the texture. The regular canned was definitely the firmest, the organic canned was most watery, and the fresh puree was the lightest and most velvety. Well, this is a tough question because each puree had good qualities. I think it depends on the use and your personal preference. Based off my taste tests, I think that fresh puree would easily elevate any savory pumpkin dish such as soup or pasta. The fresh, unadulterated flavor and fluffy texture would work wonderfully in savory dishes, especially because even “sugar pumpkins” aren’t very sweet on their own. When it comes to baking, I think you’d be fine using either canned or fresh. I’ll always keep a few cans of regular pumpkin puree in my pantry because I love to bake with the stuff. I think I will stay away from organic canned pumpkin, as surprised as I am to say so, because it just had such an odd texture that wasn’t worth the organic payoff. I’d rather make fresh than buy organic canned. Which is your favorite? 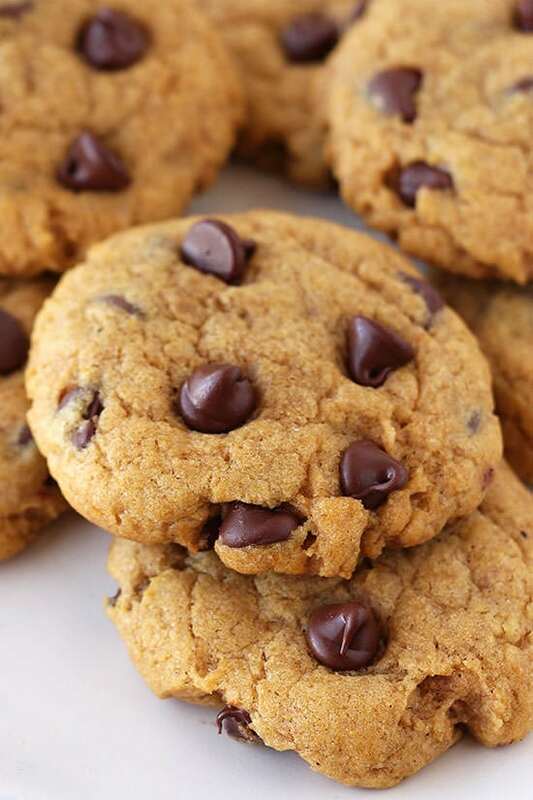 What will you try next time you’re baking or cooking with pumpkin? Preheat the oven to 375°F. Line a rimmed baking sheet with foil. Using a large sharp knife, slice off the stems then cut each pumpkin in half. Spoon out all the seeds and pulp, reserving the seeds for roasting if desired. Place the pumpkin on the baking sheet, skin side down, and roast for about 45 minutes, or until fork tender. Let cool until comfortable enough to handle. Use your fingers to peel off the skin. Place the pumpkin flesh in the bowl of a food processor, high-powered blender, or food mill. Puree until completely smooth, this may take several minutes. Turn off motor and stir mixture occasionally to ensure an even puree. If the puree looks dry, add a tablespoon or two of water. Use or store in the fridge in an airtight container for up to a week or in the freezer for 6 to 8 months. Place the pulp and seeds in a colander and run under cold water, removing the pulp from the seeds. Spread the seeds out evenly on a rimmed baking sheet and let air dry for several hours or overnight, do not attempt to blot with paper towels. Drizzle with 2 teaspoons olive oil and generously season with salt and other desired flavorings. Roast low and slow at 250°F for 1 hour, or until golden. Serve. This post came at the perfect time! I picked up a pie pumpkin when we took our son to the pumpkin patch this weekend. I made puree with it but its just sitting in a bowl in the fridge. I planned to make muffins with it but it came out so much lighter than the canned stuff I wasn’t sure if it would make the muffins too soft or watery, I’ll give it a shot, especially considering I ended up with easily 6-8 cups of the stuff. It is ugly, pinkish white, knobby, and shaped like the a two-tiered snowman. But the flavor is exceptional, texture, smooth and silky. We puree them and vacuum bag, then freeze in flat layers of bags. Too unbelievably good. Thanks so much Anita! Interesting tidbit about the odd duck shishigatani! Fascinating name AND appearance. I’d love to try that. Every year, we draw faces on our Halloween pumpkins with markers, and then, afterward, use them to make pumpkin pies for Thanksgiving. I know one is supposed to use sugar/pie pumpkins, but the gigantic Halloween pumpkins still taste pretty darned good. I cook and freeze the chunks of pumpkin first, and when thawed in a colander in the sink, a lot of water comes out, so I don’t have the “watery pumpkin” issue. I squish the pumpkin chunks into a measuring cup, and then toss them in a blender with the canned milk (I use the standard Libby’s recipe) and blend, blend, blend. It’s not stringy at all. It’s smooth and velvety, and heck, all the spices make it great. Then I continue on with the rest of the recipe. My kids have always loved the “Halloween pumpkin” factor, and even the gigantic jack o’ lanterns tasted better than that canned crap. Your testing is very interesting. Back when I was much younger and more energetic I used to make pumpkin butter from the neighbors’ Halloween jack-o-lanterns, and it turned out wonderful. I did this for multiple years and never had any issues with either texture or flavor. That said, these days I don’t enjoy regular pumpkin flavor all that much, so I think it would be helpful to use a better quality pumpkin. I’ve been buying canned, generally our grocery store brand, and think I would be much better off making my own puree if I need it for something. As usual, your experiment was very helpful. After the first year of using fresh pumpkin puree for pumpkin pies, my family will not let me go back. It’s a running joke that they do use “Libi’s” pumpkin because that’s my name. 🙂 I tend to do very large batches and freeze them in 15 oz portions. That way, I can grab what I need for pies or cookies. Unfortunately, sugar pumpkins have gotten pricey over the years. Haha! Love “Libi’s.” Hmm it would be interesting to factor the cost of buying sugar pumpkins, running the oven for nearly an hour, etc. vs. buying the canned stuff (though it sounds like you’ll never go back to canned!). Pretty random comment, but there are a few things that usually mark out US blogs straight away, 375F, ounces, gallons… but lately it’s been pumpkins. I’m going to have to check the shelves next time I go shopping and see if there’s any cans of pumpkin. It’s slightly mind boggling that you can buy pumpkin in cans at all. I’m guessing it’s part cultural part climate, because we don’t get the same deluge of pumpkin recipes in Autumn as you guys do for Fall, but we don’t really get snow either (at all here), so there’s a much longer growing season, less need for canning.. I LOVE this comparison post. I often default to canned pumpkin because I’m too lazy to add one more step to the equation, but now you’re making me want to taste test on my own! Pinned! I’ve used the farmers market organic brand for soup and had great results..but i’ve never baked with it. I love pumpkin! I think I’m ready to try making my own puree now. P.S. I did notice the cabinets. They look amazing! I just finished reading your post on the door knob update and I thought I just had the paint color stuck in my head. I was going to go back and check earlier videos. Okay, this side by side comparison is awesome! I was the most surprised by the organic! I started making fresh pumpkin puree from sugar pumpkins when I moved to Belgium. Canned isn’t available here (though they do sell it frozen in cubes which is good for savory dishes!!). It certainly is a much brighter color than the store bought stuff I used to get back home! 🙂 Great tutorial! I would love to have Susan’s recipe for pumpkin butter !! My son in law made some prickly pear jam and it was so delicious ! Pumpkin butter would be great for this fall season ! I prefer fresh pumpkin from Cinderella pumpkins. They are more expensive but it’s totally worth it. I got spoiled a few years ago when my brother in law who is a farmer started growing pumpkins and gave me as many as I wanted. Sadly that gravy train has ended which means I use more canned pumpkin than fresh. I’m not sure why your can of Farmer’s Market puree was so “watery” but I have used it for years, and it’s never been watery for me! I did once buy a can of Farmer’s Market butternut squash puree, since I’d heard that butternut squash actually makes the best pumpkin pie, and that was definitely looser and more watery. Did you maybe make a mistake and buy the wrong can? I’ve also used fresh butternut squash and once used a “cinderella” type cheese pumpkin, and the final resulting pie was no better than for the Farmer’s Market puree. Hi Ginny! Maybe I got a weird can? I definitely didn’t use butternut squash, if you peek the video at about 2:42 you can actually see the exact can I used, it’s definitely pumpkin! Thinking back to this, I’m not sure I would have specifically identified the Farmer’s Market organic puree as watery if I hadn’t been directly comparing it to the other two purees. What made the watery factor most clear is when I separately bagged and froze all three purees (after testing) at the same time, the Farmer’s Market puree was noticeably icy and hardened much faster than the others. My sister and I have been experimenting with my Grandmother Bessie’s depression era recipes, and for pumpkin pie she used hubbard squash (orange or blue). The puree looks exactly like that shown in the article, and the texture in the finished product is excellent. I just picked up two turkey sized pumpkins for $5.00 at a local farm stand in South Jersey for this years holidays. The local Maryland public radio station (WYPR.org) recently did a segment on a program called “Radio Kitchen” concerning choices for pumpkins which was quite informative. Readers should check the Podcast for the suggestions they made for other types of pumpkins. My mom and I always use butternut, acorn, or similar tasting squash (fresh) in place of pumpkin in recipes with a delicious result. Cut back on liquids by a few T. or adjust starch accordingly. I’m coming late to the party but wanted to say that when my family moved to Australia, canned pumpkin was not available so Mum had to adjust all her recipes accordingly. We make our pumpkin pie with fresh butternut pumpkin and it is delicious and the filling has the most amazing texture. Depending on how you cook the pumpkin flesh (baked, boiled, steamed – it’s all fine) and the particular pumpkin, you may have to add a little water to get the right consistency. So that’s a bit tricky but the pie is amazing and sooo yummy. I have since been given a can of pumpkin purée and it kind of grossed me out to be honest. I’ve always had good experiences using regular field pumpkins when I didn’t have sugar pumpkins on hand for pie. Even when the flesh is extremely stringy (almost noodle-like), the field pumpkin purees very nicely once in the food processor and makes a light, fluffy pie. I’ve never done a side by side taste comparison of sugar vs. field, but both make amazing pies and will beat canned pumpkin any day. Hi, I am very interested by making my homemade pumpkin puree. We love cooking with pumpkin, and as craft brewer, in order to use this one in my brewing process, do you know how to have the same color than the regular canned, I want to color my beer with my own pumpkin puree with a more darkest color than fresh puree. I’m concerned about using fresh pumpkin in baked recipes (bread and muffins). Do you have to cook it down to get the right consistency and remove some of the water? Without this step it seems to be fine in all other recipes calling for pumpkin. I have been using the farmers market brand of canned pumpkin for several months for smoothies and I must say for the past 3 weeks the consistency has been a tad bit watery. After reading Susan’s post I am determined to make pumpkin butter! Does anyone have a recipe to share for making pumpkin butter? In other words, canned pumpkin is not going to be made of the little pie pumpkins. This explains the difference in color and texture between the fresh puree and the canned. I always just eat organic due to food allergys/senitivities and I eat/use farmers market but recently bought Libbys not organic and Havent tried it yet? Tessa, could you please explain why some pumpkin purees are gritty sandy? I made a pumpkin gratin ( Pepin recipe…YUMMY) the other night and it was unbearably sandy. I’ve read others complaining of the same issue. I’ve never had this issue until now. What am I doing wrong, if anything? I used a canned organic puree. Please share your thoughts. thank you.